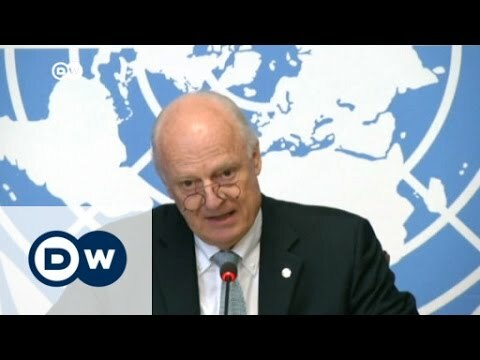 UN Special Envoy for Syria Staffan de Mistura has addressed the Levant Conquest Front, whose leader, Abu Muhammad al-Julani, has pledged allegiance to al-Qaeda leader and 9/11 mastermind Ayman al-Zawahiri. De Mistura said that among the 8,000 or so fighters from rebel groups in the East Aleppo pocket are nearly 1,000 fighters from the al-Qaeda-linked group. He asked al-Julani to withdraw his fighters from the pocket, so as to save some 250,000 residents of East Aleppo from being completely displaced and made refugees this fall. The Russian Federation and the Syrian government, when pressed as to why they are bombarding and invading East Aleppo with such ferocity, cite the Levant Conquest Front’s gains during the recent attempt at a cease-fire. De Mistura, an Italian diplomat, said that he would personally lead the evacuation and provide United Nations cover for it, if necessary. The Russian foreign ministry said that it is interested in the proposal. American readers could be excused for being confused on this issue, since our press and politicians typically present the Syrian conflict as being among only 3 sides: 1) Daesh (ISIS, ISIL), 2) the Syrian Government of Bashar al-Assad, and 3) the remnants of the Free Syrian Army, some 30 of whose groups are supported by the US CIA via Saudi Arabia. So American politicians and sometimes journalists erase regime-held West Aleppo (as many as 1 million residents) from the picture and call the East Aleppo pocket “Aleppo,” and represent it as held by freedom fighters who, Mike Pence says, must be rescued by American military intervention. From the Russian point of view, there is a fourth front of the war, which the Americans completely ignore, i.e. the fight against the Levant Conquest Front (formerly Nusra Front), which has its roots in Musab al-Zarqawi’s al-Qaeda in Mesopotamia and which spent eight and a half years killing US troops. In 2013 the al-Qaeda affiliate in Iraq and Syria split, with half of it becoming ISIL under Abu Bakr al-Baghdadi. The other half became what is now called the Levant Conquest Front. It recently tried to dissociate itself from al-Qaeda, but al-Julani declined to renounce his pledge of allegiance to al-Zawahiri, so that news conference was not very credible, and certainly not to Moscow. For reasons that remain extremely mysterious, the US CIA ignores this al-Qaeda-linked group, with which some of its own favorites have sometimes formed battlefield alliances. But for Russia, ISIL is a minor annoyance whereas the Levantine Conquest Front is the real threat, since it could take over northern Syria (it and its allies have Idlib Province) and then foment terrorism in Russia’s Muslim provinces, such as Chechnya. De Mistura’s plea to al-Julani came as the Syrian Arab Army and its Hizbullah and Iraqi Shiite auxiliaries made the biggest advances into East Aleppo since 2012, taking about half of the Bustan al-Basha district and nearing the center of the Pocket. At the same time, Damascus announced a lull in its intensive bombing of rebel targets in East Aleppo, which has killed over 300 people in the past week and done extensive damage to civilians and civilian infrastructure. My guess is that al-Julani will decline to leave, and will continue to taint the other rebels in East Aleppo with the al-Qaeda tag, even though that is extremely unfair. Many of them are actually Muslim Brotherhood or Salafis but not al-Qaeda-linked. As to whether the regime can, as de Mistura fears, take all of East Aleppo this fall, that remains murky. In the past, the Syrian army has had difficulty making permanent advances against the rebels in the north and east, often seeing its conquests later reversed. Apparently a wild card in the East Aleppo campaign, however, is that Iraqi Shiite militias have joined the fight, bumping up the manpower of the regime.